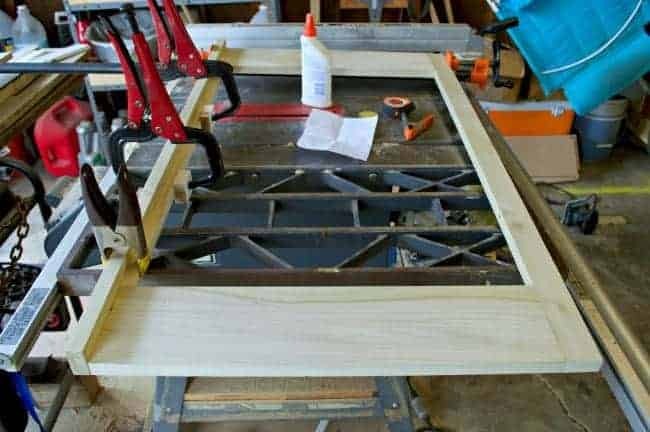 How to build a custom DIY refrigerator cabinet. 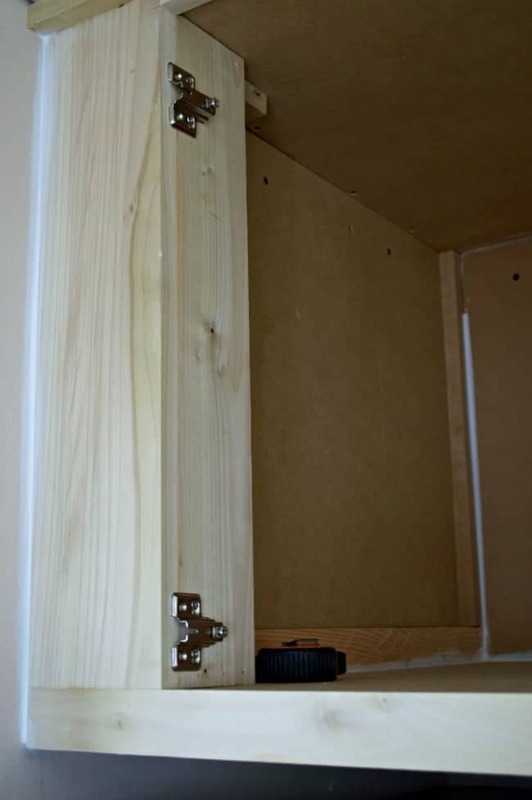 I never would have guessed that I would get excited over building a custom refrigerator cabinet. I mean, I have a beautiful plank ceiling and newly painted white kitchen cabinets to gaze at. I’m here to tell you though, that I’m giddy with happiness. Let’s start at the beginning. We have a really small kitchen that was built in the 50’s. It still had the old soffits, the ancient exhaust fan and a tiny niche for the fridge. They didn’t have the huge behemoth refrigerators you find today so our fridge space was small. We wouldn’t be changing any of that with our remodel so we had to make the space work. When we bought our house one of the things we had to buy was a new refrigerator. It couldn’t be just any fridge though, we needed a specific size. We had to be sure we could a). get it in the house and b). fit it in its little niche in the kitchen. We were able to do both but it still extends out past the bedroom door trim. A counter depth fridge would have fit the space better for sure but it just wasn’t in the budget. When we were planning this kitchen reno one of the items on my wish list was to build in the fridge to make it look less imposing. I also wanted better storage above the fridge. There was a small cabinet over it but it was hard to reach and didn’t offer a lot of storage space. We really went back and forth with this project. The hubs didn’t think we could fit a cabinet around the monster refrigerator but, in the end we were able to do it. We had to move the cabinets and stove down a little, but we were able to fit it in. The first thing we did was to remove the cabinet and remove the ugly soffit. 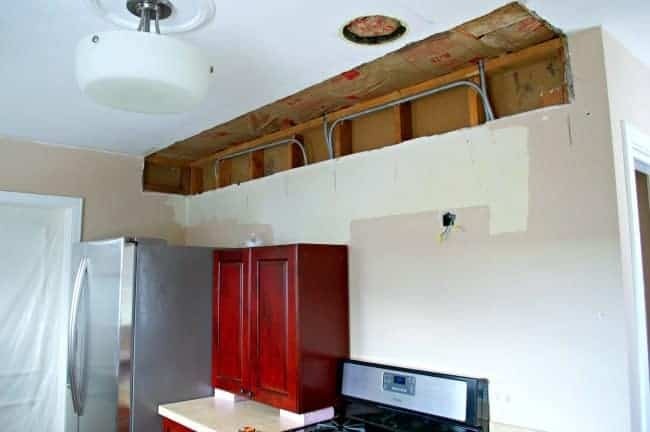 Once the soffit area was patched up, we moved the stove and cabinets down away from the fridge about an inch. The move required us to take the cabinets out and put them back in. Not a fun job, but it gave us more room to build our refrigerator cabinet. Once we figured out all the logistics in this small space, the build was pretty straight-forward. The basic pieces are a wood panel for the side and a box for the cabinet. I would say that the hardest part was constructing the front face frame for the doors, that we found at ReStore for $1 a piece. We had to build this part of the cabinet to exact measurements or the doors wouldn’t fit. We were able to use the hardware from the cabinet that was previously up here and saved some money. I’m so happy with how this turned out. 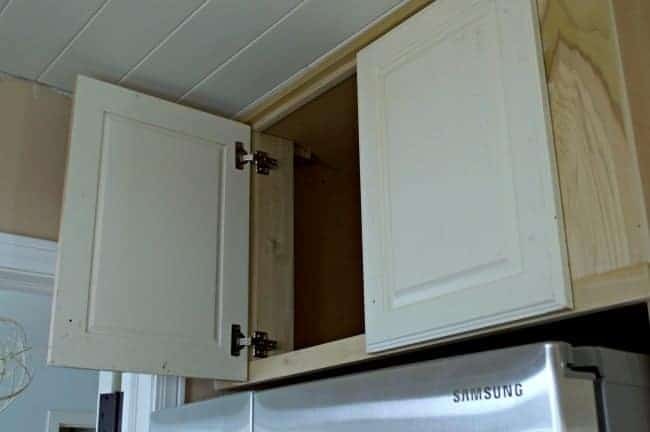 Not only does it hide the fridge, as much as it can be hidden, but I have tons of storage space that I can actually reach. All that work was definitely worth it. The next project on the list is the DIY custom range hood. 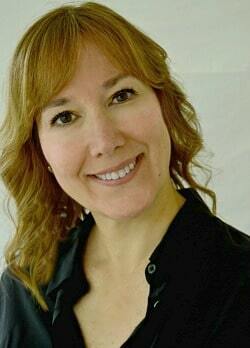 Thanks so much for following us on our kitchen remodel. I hope you have a great week. I know you posted this a long time ago but did you guys secure it to the floor? Thanks in advance. Hi Angela! No, we didn’t secure the refrigerator cabinet to the floor. We did attach it to the cabinet that was next to it though. Hope that helps! Kristi your husband did an awesome job! I too have a house from the 50’s. I hate the cabinet structure- narrow depth and shelves are unmovable..i decided to. change both.. I’m extendingvall the cabinets out 3.5″ from the facing as well as putting in bars to make shelves adjustable. We also have two pocket doors and the one for the dining room has been sacrificed so I can put a between the studs spice rack in. Thanks so much Dayna! The refrigerator cabinet was a battle to get built between the hubs and I. He didn’t see the point but he was so glad we did it after and it really wasn’t a difficult project. I’m glad I stuck to my guns. It sounds like you will have an awesome space when you’re done. 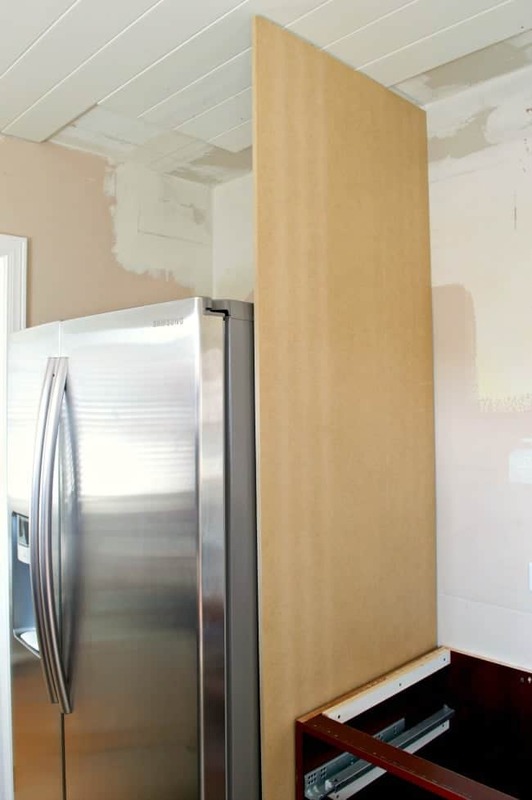 Renovating a 50’s kitchen is no small feat. Good for you and best of luck. Please stop in to let us know how it’s coming together. Thanks so much for your visit. Hope you have a great day! I know it has been a couple of years since you posted this, but this looks great! 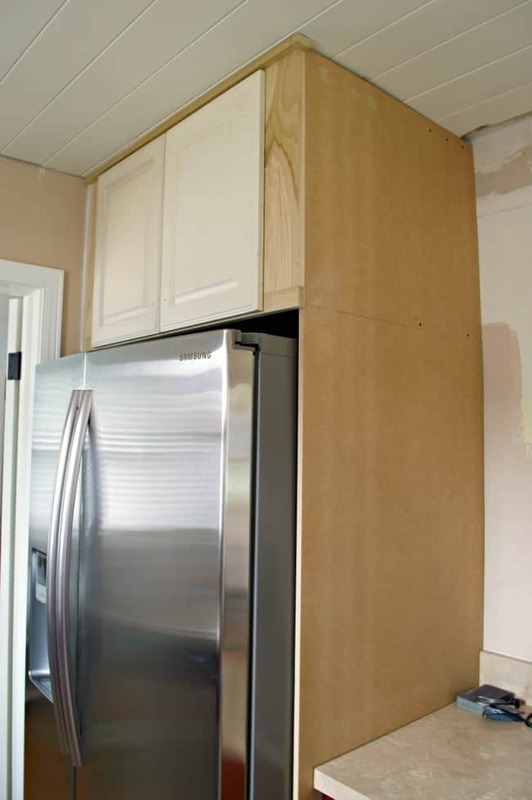 We are thinking of building a cabinet around our refrigerator -in which we replaced a few years ago. We had no idea at the time, but the refrigerator we bought (Frigidaire Gallery) was designed for built-in cabinetry and does not need much clearance around the top and sides. I love that you bumped out the top cabinet and can reach it now. 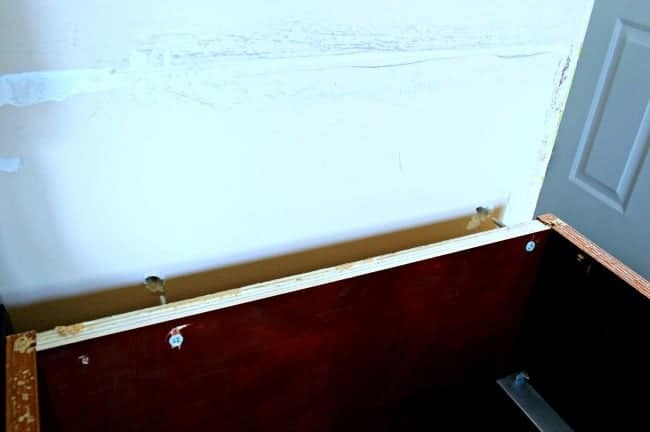 I would like to do the same, but perhaps even add a rolling shelf with a little bit of lip (kind of like a short drawer on the back and sides). That way I can more easily reach items that would be stored way in the back of the deep cabinet. Even using only 3/4 extension slides would make it so much easier to get things out, maybe? And if the item I wanted was already on the front part of the slide shelf it wouldn’t even need to be pulled out. Just brainstorming ideas. Great job! Thanks Maureen. This wasn’t one of our most popular projects during the kitchen reno, but I loved it and it really did make a huge difference in how we used the space. Great idea about the rolling shelf. We were going to add one but moved before we could get to it. In the short time we used our new kitchen though, I was able to really utilize that space above the fridge. Pulling the cabinet out was def the way to go. This is awesome. 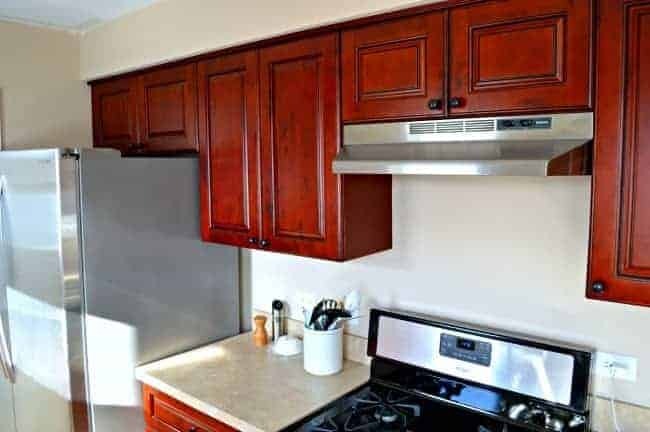 My cabinets above my fridge is not even usable. I can’t reach them and they are so small. So, they are always empty. Such a waste of space. Storing small appliances in yours is a great idea. Thanks Trish. It seems that so many of us have unusable space above the refrigerator. I agree with you in that it is such a waste of space. Good job! It looks like lots of work, but it’s worth it. Thank you for sharing at Thursday Favorite Things. Hope you have a fabulous day! Thanks so much. It was a lot of work but the storage it gives us such usable storage space. 🙂 Thanks so much for hosting Thursday Favorite Things. Your cabinet looks amazing! 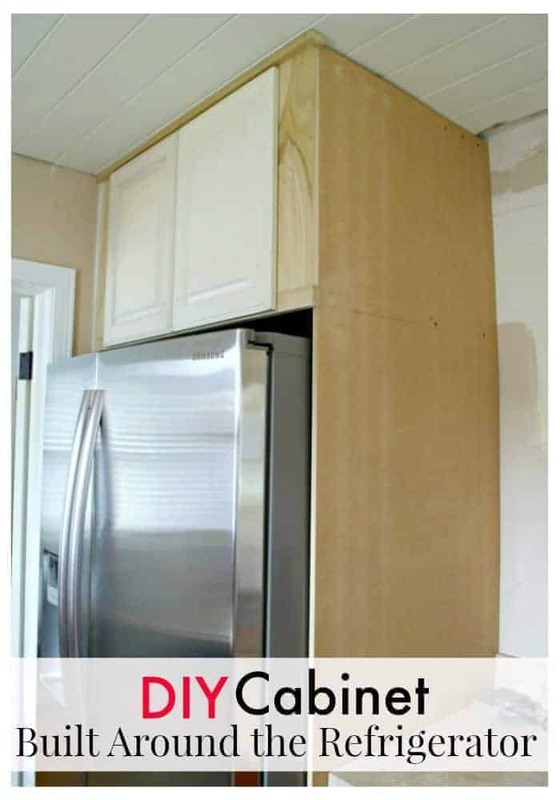 I have an itty bitty cabinet similar to the old one that was above your fridge and would love to do something like this! Thanks Candice. I could only fit 3 things in that small cabinet so I’m glad that I have more storage space. I can understand Kristin. 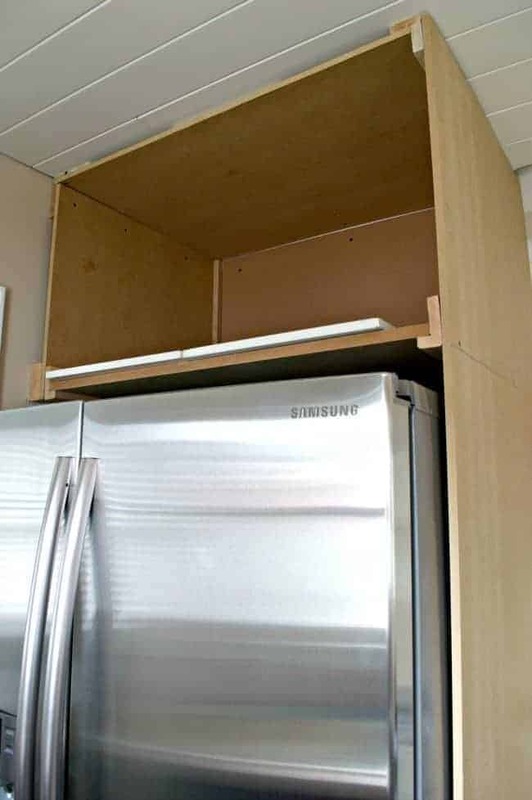 You do lose a lot of refrigerator storage space with a counter depth fridge. Wow…I would be excited too! !…great, great job! Awww, thanks so much Shirley! Hope you’re enjoying your trip. 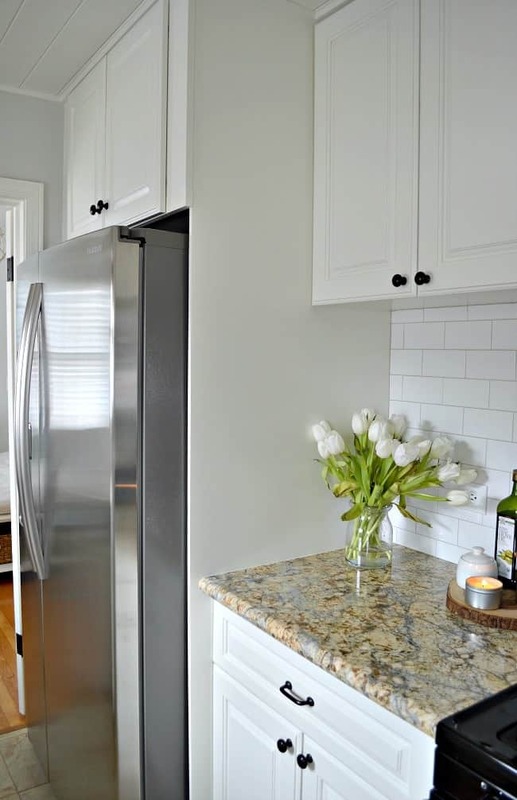 You all did a fabulous job making the refrigerator seem more a part of the kitchen! Love how you built around it. Thanks so much Mary Alice! I’m excited to see it all painted and done. Looking good! I wish I had a deeper cabinet above our fridge. Same issues, have to keep things in the basement because not enough room in kitchen. Patiently waiting for the next project . . . Take care, K! Thanks MJ. I can’t wait to get it done and fill it up, and I’m sure it will be filled. Thanks Debbie. It does give me so much more accessible space to put my blender and crockpot, things I had to keep in the basement because I had no room. I wish we had a larger panel to hide our fridge. That looks nice. I know…right? Now at least I can put a few bigger appliances in there that I had to store in my basement. Yay!